A special ceremony and event will be held in honor of the Preble County Courthouse’s Bicentennial this September. EATON — “Granite, marble, stone and the law are the foundations of this place,” Commissioner Chris Day said of the upcoming Centennial Celebration and Rededication of the Preble County Courthouse which will take place on Sunday, Sept. 9, from 1-6 p.m.
“M.J. Roche Construction of Cincinnati, Ohio received the contract and the current structure was built for the total sum of $247,912.71,” Day said. Crowell, along with Steve Pope and Janet Crowell Eby, have been planning the grand celebration for several months. The Centennial Program will begin at 1 p.m. After the program, self-guided tours of the Preble County Courthouse will be open to the public. The elected officials and departments of the Preble County Courthouse have been working diligently toward this grand celebration and they are looking forward to meeting and greeting the public in their respective offices, according to Day. Crowell added, among many beautiful and eye-catching attributes of the courthouse building is the Preble County Common Pleas Courtroom, which is open for public viewing. There are also a number of other offices which have for the most part remained the same as when built, Crowell said, such as the Preble County Clerk of Courts, Preble County Juvenile/Probate Court, Preble County Treasurer, Preble County Recorder, and Preble County Auditor’s offices, all of which have character all their own. Other offices open for tours the day of the celebration will include the Preble County Board of Elections, Preble County Prosecutor, Preble County Land Use Management, and the Board of Preble County Commissioners. The original molds of the Preble County Courthouse will be on view for the public, along with many incredible pictures of the construction of this magnificent building, Crowell said. Day added, items from the recently-opened time capsule from the Preble County Courthouse cornerstone will be displayed on the first-floor lobby area, so the public can marvel at the pieces of local history. The cornerstone was removed on Tuesday, July 24, 2018. It took four hours of work to extract one of the courthouse foundation blocks to reveal the time capsule sealed in it on March 17, 1917. According to Day, the Board of County Commissioners is currently collecting items to be placed in the 2018 time capsule. Brad Kramer has been spearheading this project. A ceremony to place the 2018 time capsule into the cornerstone will take place on Saturday, Oct. 6, at 1 p.m., with the ceremony being conducted in the same manner as was done in 1917 by the Masonic Lodge, according to Day. 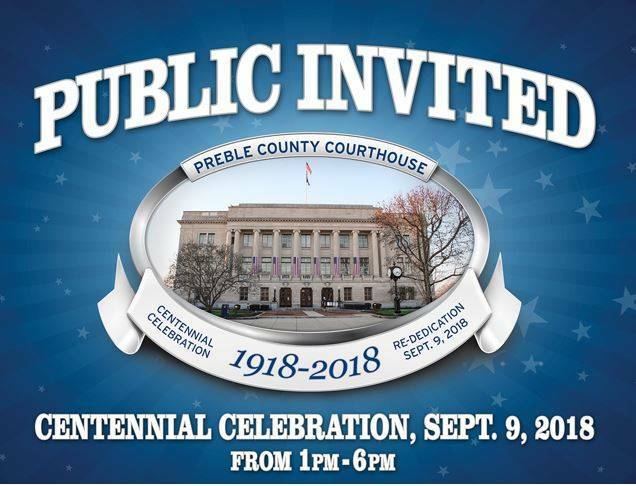 https://www.registerherald.com/wp-content/uploads/sites/41/2018/08/web1_courthouse_invite_ne2018812202929364.jpgA special ceremony and event will be held in honor of the Preble County Courthouse’s Bicentennial this September.